According to Counterpoint Research’s Market Monitor Q2 2018, the global premium smartphone segment** grew faster than the overall smartphone market. This was driven by increasing shipments from Chinese players, which have recently upgraded their flagships and are positioning them at a higher price point, at launch, compared to their previous flagship models. As these players grow outside China, premium portfolio can help them tap the developed markets like Western Europe or USA where they were unable to expand their reach previously. 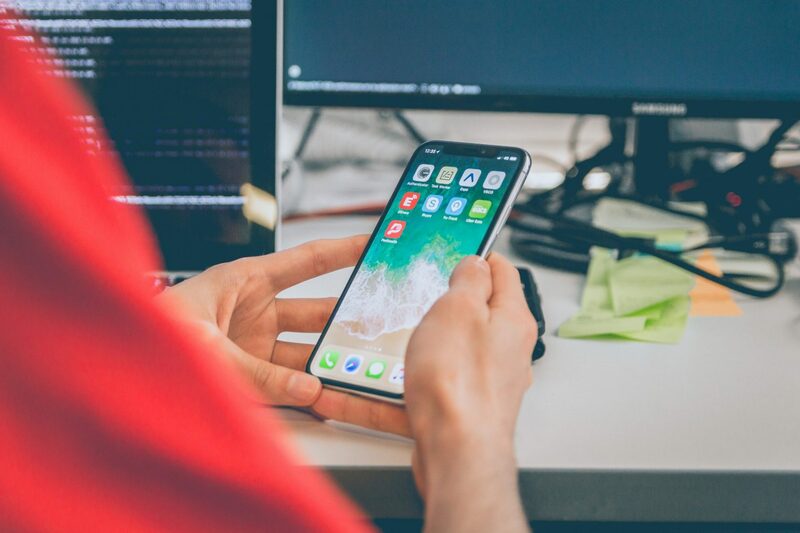 Apple led the global premium smartphone segment capturing 43% share of the segment, followed by Samsung (24%), OPPO (10%), Huawei (9%), Xiaomi (3%) and OnePlus (2%). 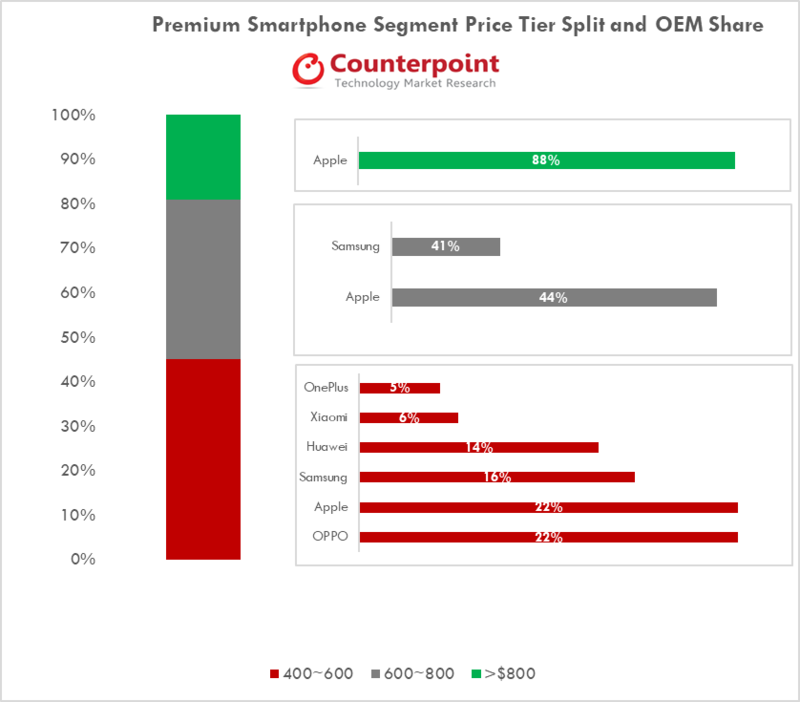 Even within the premium segment, the $400-$600 price-band, was the sweet spot as it contributed to 45% of the total premium segment sales by volume. 95% of premium smartphone OEMs have a presence in the $400-$600 segment. Going forward we expect that competition in the $400-$600 segment will increase as Chinese brands, with their flagship offerings, are planning to expand their presence further. OnePlus was one of the fastest growing brand in the $400-$600 segment. OnePlus sales were driven by India, China and UK. In India it surpassed Apple and Samsung to become the #1 premium smartphone OEM during the quarter with a strong 40% market share. It was also amongst the top five premium smartphone OEMs in France (#4), Germany (#4), Italy (#5), Netherlands (#4), Sweden (#3) and UK (#4) due to strong initial sales of the OnePlus 6. In the $600-$800 segment, Apple and Samsung alone contributed to 85% of the shipments while Huawei trailed by a big margin. In the $800+ segment, Apple clearly dominated with 88% share during the quarter. Brands like OPPO, Vivo and Huawei have tweaked their designs by adding new features, at a time when overall innovation within smartphones was already reaching its peak. Examples include the Vivo Nex (Ultra Full View Display, In-display fingerprint), OPPO Find X (Ultra Full View Display) and Huawei P20 Pro (Triple camera). Among the key Chinese brands in the premium segment, Huawei and OnePlus were the only brands with wider geographic reach. More than 95% of flagship sales for OPPO, Vivo and Xiaomi happened in China, while Huawei and OnePlus flagship sales grew in parts of Europe. Apple and Samsung sales were driven by developed markets like USA, China, Japan, Korea and countries in Western Europe. Samsung’s share in the $600-$800 segment declined due to fewer than expected sales of the Galaxy S9 series. Going forward, we estimate that the premium smartphone segment is likely to be more competitive. We further expect that vertically integrated companies will leverage their expertise to gain share in the segment. With 5G around the corner and players like Apple pushing the price points higher, Chinese OEMs have a good chance of entering new price tiers in the premium segment to drive both increased revenue and profit.